When I saw this photo I thought it was wallpaper. Instead, Andrea created this using a stencil in an Ikat pattern. I just love it. My son loves Star Wars, so when I saw this pillow made by Natalie, I just had to feature it. This is a totally no-sew project. I also learned what Frey Check is...looks like a cool product. Danielle brought an old glider back to life by re-upholstering it. She did an awesome job! Amy from Maison Decor created this shabby chic partial slipcover for her sofa. So shabby chic! Check out her smocked drapes from Pottery Barn. Aren't they gorgeous? A Vintage Vine made this bench out of a coffee table - I just love it. You have to go and check out exactly how she did it. Thanks for hosting the party! My boys would adore that Star Wars pillow! Thank you for hosting Judy! What wonderful features. I am just continually amazed at all of the incredible talent out there...you included! Your projects are always inspiring! Terrific features! 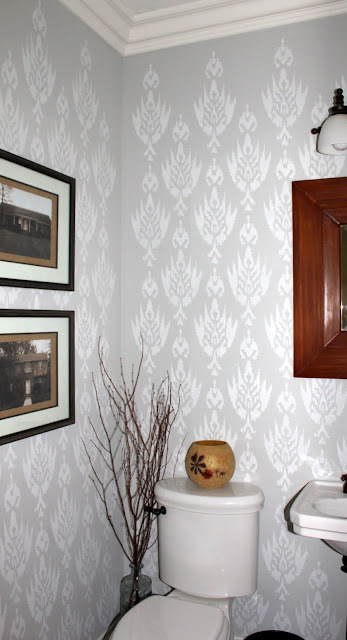 I love that ikat stencil project! Thanks for sharing and for hosting this party each week. Thanks for visiting my blog and becoming a follower. I followed you back and was excited to join your party. Thanks for hosting! Thanks for visiting DIY Addict and inviting me to your party! Love the party! So many great ideas I don't know how you could pick a few to highlight. Love the faux wallpaper! Hi, I am a new follower. Loving your blog & the awesome party! My son loves Star Wars too so I am going to have to go and check that out! Thank you for hosting. Thanks for featuring my shabby slipcover idea! I am amazed at all the talent I have seen at this party! Hi I'm a new follower. I found you from your comment on my blog, I'm glad I did. I have lots of DIY ideas, and I love the inspiration found here on your blog! "I'm so Happy you visited my Land of Blog and invited me over"!!! I am now a FOLLOWER "AND" I've linked up to your PARTY!!! I don't quite understand WHAT day it begins??? I'd like to add that to your "Button on my Blog".. I LOVE,LOVE,LOVE those neckroll pillows you made your folks! They are such FUN! I will have lots of FUN exploring here... Thank you again for becoming my newest FOLLOWER! 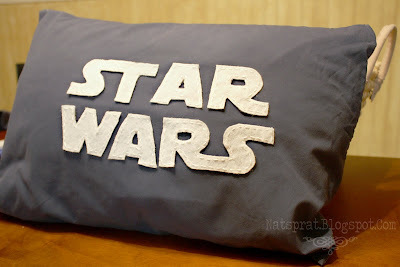 I love the Star Wars pillow! My man is obsessed with Star Wars. I will have to make a pillow like that for him as well, thanks for the idea.